Read an interesting article from Register the other day about IBM’s Almadan Research lab using standard Non-volatile memory devices to implement a neural net. They apparently used 2-PCM (Phase Change Memory) devices to implement a 913 neuron/165K synapse pattern recognition system. This seems to be another (simpler, cheaper) way to create neuromorphic chips. We’ve written about neuromorphic chips before (see my posts on IBM SyNAPSE, IBM TrueNorth and MIT’s analog neuromorphic chip). The latest TrueNorth chip from IBM uses ~5B transistors and provides 1M neurons with 256M synapses. But none of the other research I have read actually described the neuromorphic “programming” process at the same level nor provided a “success rate” on a standard AI pattern matching benchmark as IBM has with the PCM device. The IBM summary report on the research discusses at length how the pattern recognition neural network (NN) was “trained” and how the 913 neuron/165K synapse NN was able to achieve 82% accuracy on NIST’s handwritten digit training database. The paper has many impressive graphics. The NN was designed as a 3-layer network and used back propagation for its learning process. They show how the back propagation training was used to determine the weights. The other interesting thing was they analyzed how hardware faults (stuck-ats, dead conductors, number of resets, etc.) and different learning parameters (stochasticity, learning batch size, variable maxima, etc.) impacted NN effectiveness on the test database. Turns out the NN could tolerate ~30% dead conductors (in the Synapses) or 20% of stuck-at’s in the PCM memory and still generate pretty good accuracy on the training event. Not sure I understand the learning parameters but they varied batch size from 1 to 10 and this didn’t seem to impact NN accuracy whatsoever. In trying to understand which PCM devices were in use, the only information available said it was a 180nm device. According to a 2012 Flash Memory Summit Report report on alternative NVM technologies, 180nm PCM devices have been around since 2004, a 90nm PCM device was introduced in 2008 with 128Mb and even newer PCM devices at 45nm were introduced in 2010 with 1Gb of memory. So I would conclude that the 180nm PCM device supported ~16 to 32Mb. What can we do with todays PCM technology? Unclear what technology was used for the ‘synapses’ but based on the time frame for the PCM devices, this should also be able to scale up by a factor of 32-64X or between ~5.3M to ~10.6M synapses. Still this doesn’t approach TrueNorth’s Neurons/Synapse levels, but it’s close. But then 2 4-16Gb PCMs probably don’t cost nearly as much to purchase as TrueNorth costs to create. The programing model for the TrueNorth/Synapse chips doesn’t appear to be neural network like. So perhaps another advantage of the PCM model of hardware based AI is that you can use standard, well known NN programming methods to train and simulate it. So, PCM based neural networks seem an easier way to create hardware based AI. Not sure this will ever match Neuron/Synapse levels that the dedicated, special purpose neuromorphic chips in development can accomplish but in the end, they both are hardware based AI that can support better pattern recognition. Using commodity PCM devices any organization with suitable technological skills should be able to create a hardware based NN that operates much faster than any NN software simulation. And if PCM technology starts to obtain market acceptance, the funding available to advance PCMs will vastly exceed that which IBM/MIT can devote to TrueNorth and its descendants. Now, what is HP up to with their memristor technology and The Machine? Recently MIT announced a new brain chip, a breakthrough device that simulates a single brain synapse with an analog chip. We have discussed before the digital nueromorphic chip activity going on (see my IBM introducing their SyNAPSE chip and Electro-human interface posts). However both those were digital, this new MIT chip is analog. The chip uses ~400 transistors and was fabricated using VLSI processing. Given that the world has gone digital, analog devices may be foreign to most of us. But analog dominated the way electronics worked for the first half of last century and were still pretty prominent during the last half. Nowadays, such devices are used primarily in signal processing, and where streams of data are transformed from one mode to another (serial/deserializers). An analog signal has a theoretically an infinite resolution (Wikipedia), which should make it closer to real life and may be why some stereophiles perfer records to CDs. That being said, it’s a treat to see some new analog technology come out that’s better than digital implementations. One would have to say that neural activity is by definition analog and as such, should make simulating brain activity much easier. The advantage of analog can be seen in that the neural synapse is the connection between two neurons. Information is transferred between the two neurons by the take up of Ions. In the case of the MIT synapse chip, the same sort of process occurs but in this case information flows based on gradients of electronic potential. 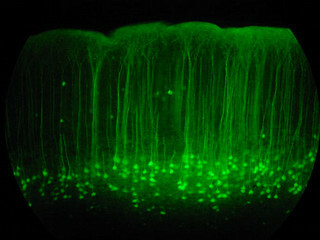 In testament to the capabilities of the new synapse chip they were able to resolve a long standing debate in neuro-biology. 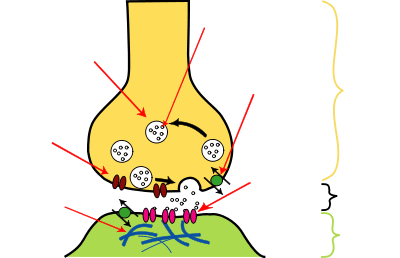 The question was on how long term potentation (LTP) and long term depression (LTD) which enhances or depresses the information transfer across the synapse was accomplished in real neurons. Previously, it had been postulated that LTP and LTD would depend on two different mechanisms in real cells. But there was one theory that said with a specific type of receptor, both LTP and LTD could be performed in a single way. MIT researchers were able to configure their synapse-chip to mimic that new receptor and were able to show how LTP and LTD could work with this single receptor in the brain. Of course a single synapse is not much considering the brain has 100B neurons each with many 100’s if not 1000’s of synapses. But it’s a start. Naturally, considering its built out of transistors using CMOS technology, it should follow Moore’s law and after 18 months or so we should have a chip with two synapses on it. Another 40 or so doublings more (~60 years from now in 2071), if Moore’s law holds, we can have a brain-chip with 100B neurons and 100T synapses on it. Of course, this being a prototype, I suppose with today’s fabrication capable of creating 40M transistors/chip, we may already be able to simulate 100K synapses and 100 neurons. Which means we should have a brain’s level of neurons and synapses in 30 doublings or ~2056. The other nice thing about analog logic and transistors, is that information processing in the brain-chip should be orders of magnitude faster than the brain’s biological processing. Which is probably even more frightening. The IBM SyNAPSE chip mentioned earlier was an all digital creation and had two chip cores, one provided “learning synapses” and the other “programmable synapses”. This was probably an attempt to mimic neural processing in digital logic. The analog brain-chip that MIT has invented, has no such distinction, supplying all synapse functionality in 400 transistors. 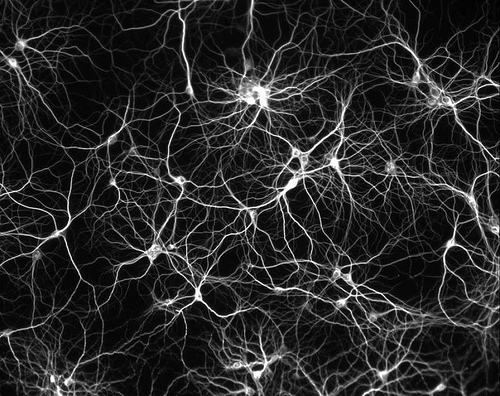 Nonetheless, any accurate simulation of neural processes can help us to understand how to mimic it better. The fact that we have an analog simulation neural processes should help us improve the digital simulation to more closely match the brain. Now that we know the date for the singularity, hopefully we can be ready to deal with whatever happens then.